I think maybe big data is being under-hyped. Come on now: isn’t big data being hyped enough already? It’s not like a few years ago, when so many were uncertain as to what the term meant. People get it now. They know what big data is. In fact, at least one major survey shows that big data has pretty much become mainstream. Everybody is doing it. And, interestingly, even as people have come to know what it is, to accept that it exists, and to engage in big data projects…they still don’t much care for the term. If everybody is doing it now, what need could there be for further hype? If anything, maybe we can and should be talking about it a bit less now that it has gone mainstream. Besides, if people don’t care for the term now, more hype cycles aren’t going to do much to help, are they? General Electric (GE) has recently announced substantial changes to the design of the CFM Leap aircraft engine, which powers the Airbus A320neo, Boeing 737 Max and COMAC C919 aircraft. The new generation Leap is “designed to provide significant reductions in fuel burn, noise, and NOx emissions compared to the current… engine.” It is designed to generate 32K pounds of thrust, achieve a 99.87% reliability rate, and introduce a $3 million operating saving annually. Where will these savings come from? New sensors intricately track how the engine is operating. The use of data fundamentally transforms how the engine operates and makes it more efficient. But that efficiency requires a lot of data. The new version of the Leap aircraft engine generates 1 TB per day from those sensors alone. Add in avionics, traffic data, weather data… a massive amount of information is generated just from taking a flight. In previous versions, the Leap engine has completed more than 18 million commercial hours of operation, with some 22,000 of the engines manufactured. So we’re talking about a lot of data. An aircraft engine becomes smaller, cleaner, and more efficient. These changes in the physical properties of the engine have been achieved by generating, manipulating, and responding to data. Of course, if this one jet engine were the only example of such a shift, it wouldn’t be terribly persuasive. But the examples are everywhere. 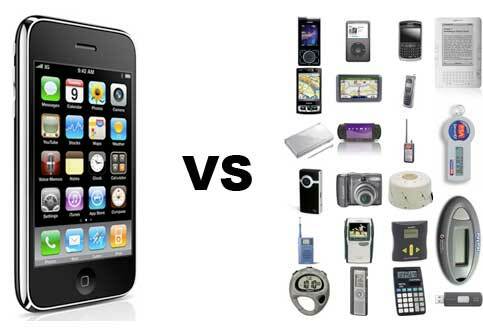 A few years ago there was a lot of discussion about how the new smartphones were replacing so many other devices. You no longer needed a digital camera, a music player, a gps system. The phone did it all. where did all those separate devices go? Their physical footprints were dramatically reduced; their data footprints took up the slack. Meanwhile, consider how many of your interactions with others, how much of what you do and think and communicate, how much of your self is now closely associated with that same device. What is a human life made of? Lots of things, obviously. But increasingly, one of the biggest component parts of our lives is the data component. Like that jet engine, we’re growing bigger and bigger data footprints. We seem to be transitioning from a world made out of stuff to a world made out of data…and stuff. Stephen Gordon’s In the Future, Everything Will Be a Coffee Shop is premised on this same shift from a world made primarily of stuff to a world made primarily(?) of data. R. Buckminster Fuller described a process that he called ephemeralization, whereby “you do more and more with less and less until eventually you do everything with nothing.” We are definitely doing more with less these days, although doing everything with nothing remains some distance ahead. But as we use less stuff — less energy, matter, time and space — to do the things we do, we are using more and more data. Big data really is changing the world around us. We need to be aware of this process, and try to understand it. So let’s have some more big data hype. The use of data is still undersold, because most people still don’t believe in data. Large datasets are great. But unless your application is one like indexing the web, where each piece of data is important, you’re probably better off filtering your data and processing the 1% that’s useful than putting it all in the cloud and using map-reduce on it to get a 1% improvement in the result.